Everyone knows eating too much sugar can lead to tooth decay, but few are aware of exactly how that happens. It’s not the sugar itself that does the damage, but rather the chain of events that takes place after you eat that piece of cake. Your children may be more inclined to heed your warnings about the effects of sugar on teeth if they know about the continuous tug-of-war taking place inside their mouths. Here’s how taking certain actions can prevent tooth decay from hijacking your family’s oral health. According to the National Institute of Dental and Craniofacial Research (NICDR), the mouth is full of hundreds of bacteria, many of which are beneficial to the oral ecosystem. However, certain harmful oral bacteria actually feed on the sugars you eat to create acids that destroy the tooth enamel, which is the shiny, protective outer layer of the tooth. Cavities are a bacterial infection created by acids, that cause your teeth to experience a hole in them. Without treatment, cavities can progress past the enamel and into the deeper layers of the tooth, causing pain and possible tooth loss. Your teeth are frequently under attack by acids, but the good news is this damage is constantly being reversed. Acids leech minerals from the enamel through a process called demineralization. Fortunately, the natural process of remineralization replaces those minerals and strengthens the teeth all over again – and your saliva is a key player. Saliva contains minerals such as calcium and phosphates to help repair the teeth. Fluoride is another mineral that helps repair weakened enamel. However, replacing lost minerals can only do so much to prevent the effects of sugar on teeth if you eat lots of sweets and starches throughout the day. Limiting your sugar intake is vital if you want to give your mouth a fighting chance to fix the damage. Experts at the University of Rochester Medical Center offer several tips for preventing cavities. In addition to cutting down on sugar, stimulating saliva flow is recommended to help bathe the teeth in minerals. Chewing sugarless gum and incorporating fibrous vegetables and fruits into your diet are good ways to salivate. 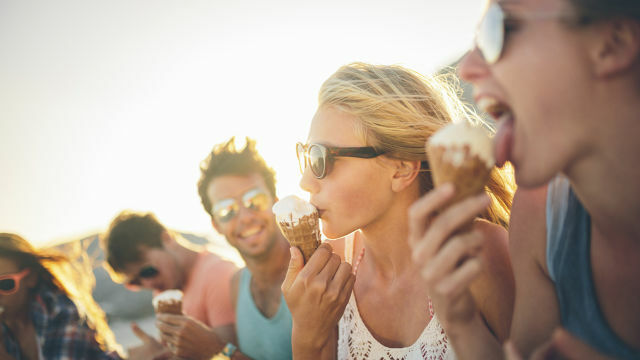 Cheese, yogurt and other dairy products also contain calcium and phosphates to strengthen the teeth, and are much better choices for snack time than sugary or starchy treats. Additionally, green and black teas contain substances that help suppress harmful oral bacteria, so adding a few cups to your daily routine – without sugar, of course – can help maintain a healthy balance in the mouth. Finally, fluoride is a mineral that not only prevents tooth decay, but also reverses it in its early stages, according to the American Dental Association (ADA). So drink plenty of fluoridated water and brush regularly with an ADA-approved fluoride toothpaste such as Colgate Total®, which cleans out sugar-dependent germs for up to 12 hours. The ADA also recommends professional fluoride treatments from a dentist. Constant vigilance is the key to preventing the negative effects of sugar on teeth. Encourage your kids to limit their sugar intake, brush away bacteria-filled plaque regularly and consume healthy foods that strengthen the teeth. Add regular dental visits and fluoride treatments to the mix, and you and your loved ones have the best shot at winning the battle against tooth decay. How often dental X-rays, also known as radiographs, should be taken depends on your individual health needs. A dental X-ray examination can reveal damage to oral structures not visible during a regular exam. 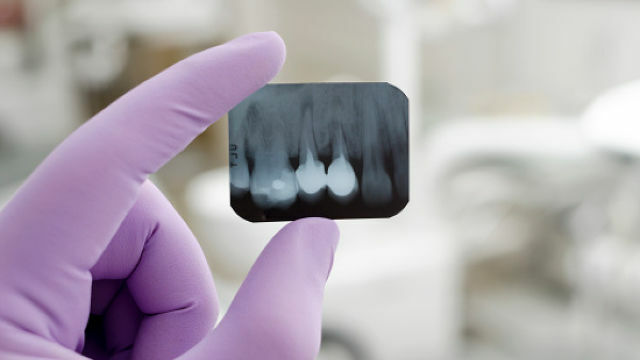 Among the problems that can be detected by a radiograph examination are small areas of decay between the teeth or below existing fillings, infections in the bone, periodontal disease, abscesses or cysts, developmental abnormalities and some types of tumors. Finding and treating such dental problems at an early stage can save time, money and unnecessary discomfort. It is important to recognize that just as each patient is different from the next, so should the scheduling of X-ray examinations be individualized for each patient. Your dentist will review your history, examine your mouth and then decide if you need radiographs and what type. If you are a new patient, the dentist may recommend radiographs to determine the present status of the hidden areas of your mouth and to help analyze changes that may occur later. If you have had recent radiographs at your previous dentist, your new dentist may ask you to have the radiographs forwarded. The schedule for receiving radiograph examinations at recall visits varies according to your age, risk for disease, and signs and symptoms. Recent radiographs may be needed to detect new cavities, determine the status of periodontal disease or evaluate growth and development. Children may need X-ray examinations more often than adults because children’s teeth and jaws are still developing and are more likely to be affected by tooth decay than those of adults. To learn more about dental X-ray examinations, visit the American Dental Association Web site at www.ada.org. The reasons for braces and orthodontic treatment vary from patient to patient. Approximately 3 million American and Canadian teens have braces, with the number of adults beginning orthodontic treatment rising at a steady rate. Your dentist will typically be the first person to mention orthodontic treatment, and will likely send you or your loved one to see an orthodontist for a consultation. The American Association of Orthodontists (AAO) recommends that children should be seen for their first orthodontic consultation no later than age 7. While the age of 7 may seem unusually early to consider braces, this pre-screening will give the orthodontist the opportunity to use preventative measures to possibly correct situations that may lead to braces in the future, and /or advise the parent on future orthodontic treatment planning. Adults seeking orthodontic treatment may consult with their dentist at any time, since it is never too late to consider correcting your teeth. The initial consultation with the orthodontist is typically a visual evaluation of the patient’s teeth and facial structure, with discussion to follow. If the orthodontist requires more in-depth information, or the patient agrees to begin treatment, diagnostic records are then taken of the patient. These diagnostic tools, consisting of x-rays, models of the patient’s teeth, and photographs of the patient’s face and teeth, are used by the orthodontist to study and formulate a treatment plan to present to the patient. Although most orthodontists do not require a referral from your general dentist, it may be helpful if you obtain one when it comes time to choosing a dentist that is right for you. Braces are used to move teeth into the ideal position and align how they bite together, known as occlusion. Class I – Considered the ideal relationship between the upper and lower teeth. Crowding or spacing may be present with Class I bite. Class II – Commonly known as “over bite.” The patient’s lower first molar is positioned posterior, or more towards the back of the mouth. The upper jaw, or maxilla, appears to protrude forward. Class II bite has two sub classes that also describe the position of the upper front teeth, but in both cases, the molar relationship is the same. While some patients may have the ideal bite, they may suffer from varying degrees of crowding or spacing, another factor associated with a misaligned bite. Crowding is a condition that causes the teeth to overlap, rotate, and in some cases, grow into the incorrect position in the mouth, or in more extreme cases, cause the tooth to become trapped in the bone. Crowding may be caused because the dental arch is too small for the adult teeth, or the adult teeth are larger than normal. Crowding may also be caused by losing the primary or baby teeth early, or retaining them in the mouth longer than normal. These factors may inhibit the adult tooth, forcing it to erupt or grow into an incorrect position. Crowding makes it difficult to brush and floss the teeth correctly, possibly resulting in tooth decay or gingivitis. Alternatively, varying degrees of spacing may be present, due to smaller teeth or jaw size. The most obvious example of spacing is the diastima, a space between the upper two front teeth, known as the centrals, made famous by Madonna. Patients experiencing any of the above symptoms should contact their dentist to determine the cause of their condition. Aesthetics do, however, play an important role when it comes to deciding if braces are right for you. Self confidence may improve for patients that have concerns with the appearance of their teeth or facial shape. Many treatment options are available for correcting the look of your teeth and smile. Healthy teeth and gums, improved facial structure, and enhanced self esteem are just few of the many benefits of correcting your teeth with braces. To find an orthodontist in your area, visit the American Association of Orthodontics website, or book an appointment with your family dentist. Source: The American Association of Orthodontists. 1. Your toothbrush bristles aren’t soft enough. When you bought your toothbrush did it say “Soft” or “Extra Soft” on the package? No? Then it’s probably the wrong toothbrush. Hard bristles can weaken tooth enamel. You also want the head of the brush to be small enough to easily reach all your teeth. 2. You’re brushing too hard. Going at your chompers like you’re sandblasting a floor is just going to do more damage to your tooth enamel and can even hurt your gums and lead to gum recession. If you simply can’t control your strength, an angled handle can help ease the pressure on your teeth. 3. You’re holding your toothbrush too tightly. If you’re holding your toothbrush with Kung Fu grip, it’ll make you more likely to saw away in a manner that can wear away your enamel. Find a brush with a handle that is easy to hold with a light grip. 4. And at the wrong angle. The American Dental Association recommends holding the surface of the toothbrush bristles at a 45-degree angle to the front of your teeth. Then, brush in small strokes (think one-tooth-at-a-time) or in tiny circles. Don’t forget the insides, too, as well as the chewing surfaces. 5. You don’t watch what you’re doing. Multitasking is a great way to do two things poorly. Rather than checking Instagram or wandering around the house while you brush, look at yourself in the mirror. (Oh, hey there.) Focus to make sure you get all your teeth, all the way up to the gum line—even those guys way in the back. 6. You don’t brush for long enough. The ADA says you should brush for at least two minutes. Some dentists recommend going up to four minutes. Check the clock—or invest in a powered toothbrush with a timer. 7. You skip brushing before bed. Of course, after a long day (or a long night) sometimes we all just want to say phooey to our hygiene routines and flop in bed. But just think of it this way: That’s seven or eight (or 11) uninterrupted hours for bacteria to do their dirty work, irritating your gums and causing tooth decay, and for plaque to harden into tartar. 8. You forget to brush your tongue, too. Your tongue is actually one of the biggest sources of bad breath on account of all the microbes and food debris that get stuck on it. Get that gunk off. According to the ADA, studies have shown that just brushing your tongue can reduce bad breath by as much as 70 percent. 9. You fail at flossing. To paraphrase the late, hilarious standup Mitch Hedberg, we know it’s as hard to start flossing as it is to stop smoking. But there’s a reason your dentist is always giving you a hard time about it. The food hiding between your teeth that so eludes your toothbrush’s bristles harbors bacteria that cause tooth decay. Oh, and PS, dragon breath, that stuff stinks, too. 10. Your toothbrush is too old. Bristles become frayed and worn over time, which makes them less effective at cleaning and potentially more damaging to the teeth. Plus, cracked or broken bristles are havens for bacteria. Get a new brush every three or four months. 11. You disinfect your toothbrush constantly. This can actually just make your toothbrush age faster. The best way to clean your toothbrush is to rinse it thoroughly under the tap and store it upright to air-dry. 12. You keep your toothbrush in a covered holder. It’s OK for protecting it while traveling, but routinely storing your brush in a closed, moist container is more conducive to microbial growth. 13. You replace your toothbrush every time you get sick. No need! Whatever germs are on your brush are the same ones your body just built up a bunch of antibodies against. Don’t waste your money. 14. You use your boo’s brush. Your body is not prepared to fight of someone else’s germies, however, so using their toothbrush increases your risk of infections. In a study, Identification of unrecognized diabetes and pre-diabetes in a dental setting, published in the July 2011 issue of the Journal of Dental Research, researchers at Columbia University College of Dental Medicine found that dental visits represented a chance to intervene in the diabetes epidemic by identifying individuals with diabetes or pre-diabetes who are unaware of their condition. The study sought to develop and evaluate an identification protocol for high blood sugar levels in dental patients and was supported by a research grant from Colgate-Palmolive. The authors report no potential financial or other conflicts. For this study, researchers recruited approximately 600 individuals visiting a dental clinic in Northern Manhattan who were 40-years-old or older (if non-Hispanic white) and 30-years-old or older (if Hispanic or non-white), and had never been told they have diabetes or pre-diabetes. Approximately 530 patients with at least one additional self-reported diabetes risk factor (family history of diabetes, high cholesterol, hypertension, or overweight/obesity) received a periodontal examination and a fingerstick, point-of-care hemoglobin A1c test. In order for the investigators to assess and compare the performance of several potential identification protocols, patients returned for a fasting plasma glucose test, which indicates whether an individual has diabetes or pre-diabetes. Researchers found that, in this at-risk dental population, a simple algorithm composed of only two dental parameters (number of missing teeth and percentage of deep periodontal pockets) was effective in identifying patients with unrecognized pre-diabetes or diabetes. The addition of the point-of-care A1c test was of significant value, further improving the performance of this algorithm.